One thing you need to know about me is that I'm tool and construction-retarded. I can't hang a picture on a wall, unless crooked and off-centered is ok. (Actually I'm just too lazy. But when Jerud and I started dating, all my framed photos were waiting to be hung on the floor below their wall spots.) When Jerud suggested we rebuild the roof ourselves I was adamantly against it. After all, the roof is an extremely important part of the RV. It's going to have a lot of weight on it - that's where the solar panels will be installed and we'll have to walk on it. And we (I) have no idea what the hell we are doing…which means we'll end up having the roof fly off while we are towing the RV down the interstate. This is a terrible idea, I kept saying to myself. 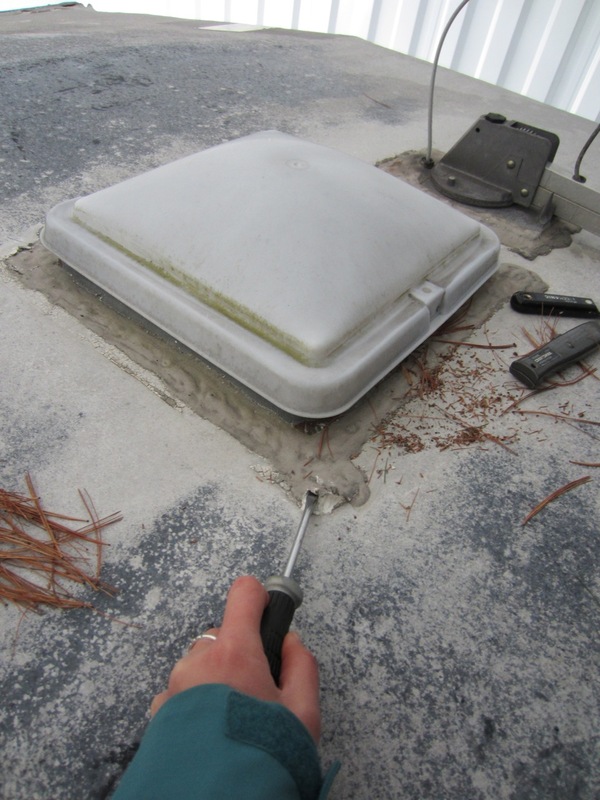 But Jerud was set on it: it would save us a lot of money, we can add features (ex: skylights) where we wanted it, a chance to install reinforcements for the solar panels, and Jerud didn't trust an RV repair shop to do work that's unusual for them. I finally watched a YouTube video of a random guy replacing his RV roof and afterwards said to myself, that seems doable. Thanks random guy! 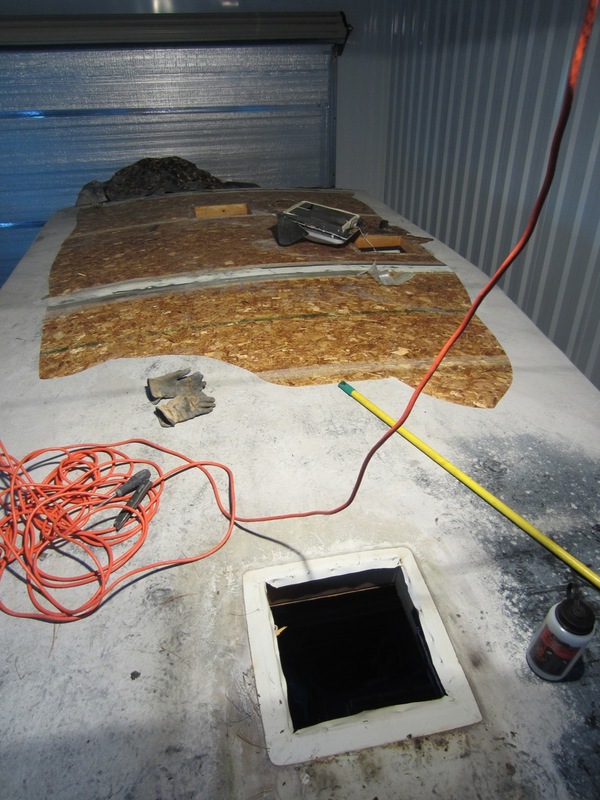 The roof was the first thing we tackled after getting the RV into storage unit. First step was removing everything off the roof. We're not going to put a lot of it back. Because we'll be relying on solar power and plan on boondocking 99% of the time, we can't (and don't want to) have central A/C and heat, TV and a gas powered fridge. Items coming off the roof for good. Trying to figure out how to actually get everything off took us a little while and a few different attempts. Flathead screwdriver is my best friend. Used it non-stop to get the caulk off the screws holding everything down. The dogs hung out below waiting for us. Tyki, a dog we're fostering, is on the leash because the garage door is open. 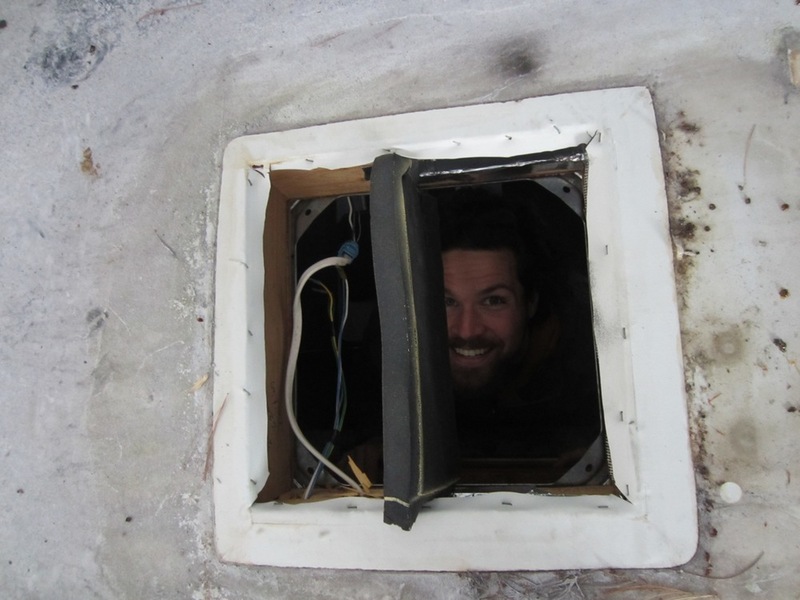 After removing the caulk from the screws and unscrewing the screw, we had to cut the rubber around the vents and then physically pull the vents out of the roof. Turns out the rubber fabric was also stapled to the sides of the wood vent opening. A/C and heater unit. It took both of us and two ladders to carry it off the roof because it was heavy and awkwardly shaped. Removing everything from the roof created new views into the RV. Once we got everything off the roof, it was time to take off the EPDM rubber and find out what kind of condition the roof was in. Before purchasing the RV we knew that the roof had a leakage problem from its previous owners, but Tom Johnson (local RV dealer) said it was fixed. But after we purchased the RV and during the time it was parked at Tom Johnson, it had another leak in the roof. Jerud found it and patched it up. We suspect there's still water leakage occurring because we'd see new water streaks on the bed headboard area when we visited the RV. We weren't sure how bad things were until now. NOT GOOD. The roof right above the bedroom is in bad condition. The wood is totally rotted. Ripping the rubber off the roof is really tiring work for one person. I used an X-Acto knife to cut slits in the rubber, used a flat-head screwdriver to get an edge of the rubber up and pulled. Then repeat. The wood underneath the rubber is extremely sticky. Wear crappy clothes when doing this! Did I mention that the local electricity company screwed up and didn't turn on our unit electricity correctly? So we didn't have working overhead lights and had to use someone else' electricity to plug in our hanging construction light. Did I mention it's winter? Seeing the wood-rot confirmed what we had imagined, but hoped it wasn't true. The upside is that it'll be fixed and we won't have to worry about it again - unless we put the new roof on incorrectly and it does flies off while we're driving.